You've no doubt noticed that things are starting to get busy for Death Cab for Cutie these days, what with their latest full-length Codes and Keys just around the bend. You may also remember that the troupe recently announced an upcoming live concert DVD at the beginning of the week. While we didn't have too many details beyond the film being recorded at the end of the last Death Cab's last tour in Bellingham, WA, the band have just given us the full scoop. Titled Live at the Mt. Baker Theatre, the film covers a two-night stint at the Pacific Northwest venue, located in the band's once hometown, and is also said to feature some docu-pic-style footage of the group discussing what it was like growing up in the town. Judging by the tracklisting, which you can see below, it looks like a healthy cross-section of pre-Codes and Keys material was played at the shows. Live at the Mt. Bake Theatre will be released May 31. Yup, that's the same day that Codes and Keys comes out. 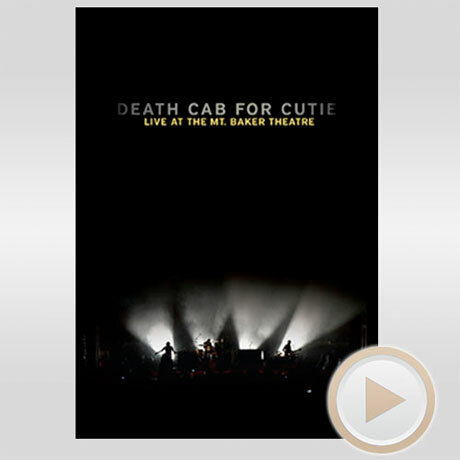 While the sale date is a couple months away still, you can pre-order the DVD here on Death Cab's site. 2. "Why You'd Want To Live Here"
8. "I Will Possess Your Heart"
12. "The Sound Of Settling"
14. "I Will Follow You Into The Dark"